Pizza with mushrooms. Recipes from Russia. 1 cup canned salted mushroom, cut into strips. 1 onion, sliced and separated into rings. 4 oz. diced cooked ham or chicken. or dried greenery to taste. 1. Make the dough: place all ingredients in the bowl, knead the dough, than make it into ball, and leave it in a bowl, covered with a damp cloth for 20 minutes. 2. Roll dough out on a floured work surface to make shapes and size of the baking tray. Place the dough on the greased baking tray. 3. Bake in 425 °F degrees oven until golden brown on top. Take away from oven. 4. 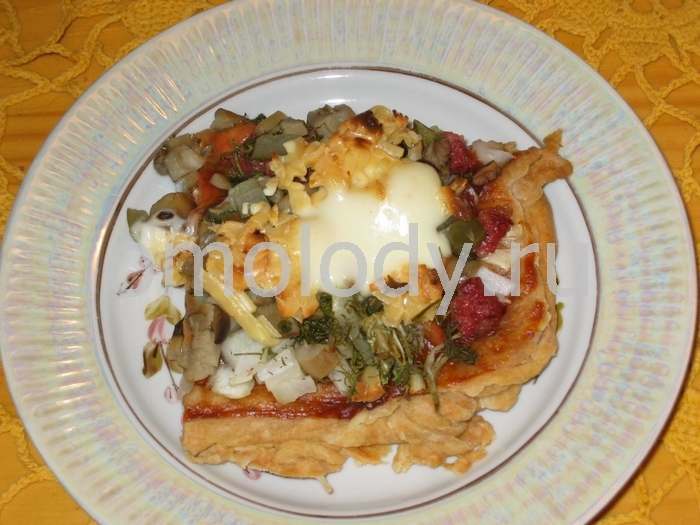 Top the crust with tomato sauce, spread it well, add mushroom strips, ham, tomato, pickled cucumber, onion and greenery. 5. 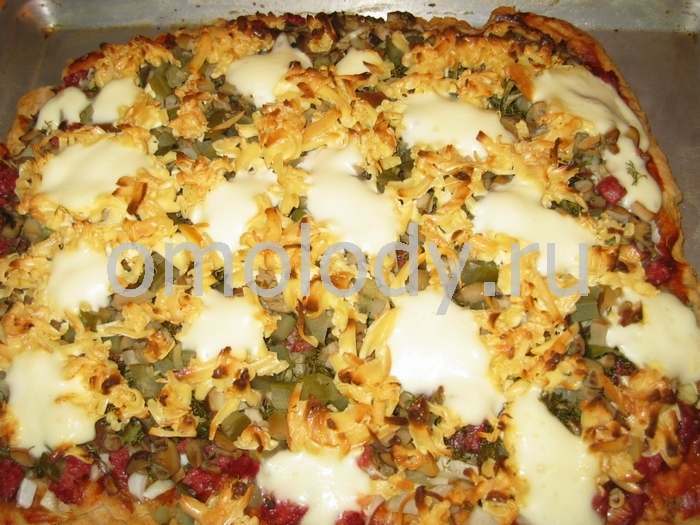 Scatter with grated Swiss cheese over the topping. Top with mayonnaise. Bake at 350 - 400°F for 10 to 12 minutes or until cheese is melted and pizza is heated through. Makes 8 - 10 servings.